Colovian Trooper is a common Endurance creature card. 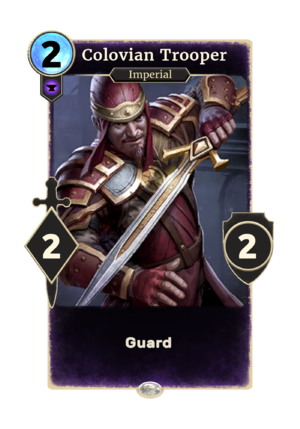 Colovian Trooper originally had the art that is currently on the Kvatch Soldier card. The current art on Colovian Trooper originally came from a card called "Skingrad Soldier" in the Gameplay Overview video. During open beta, "Skingrad Soldier" had been renamed to "Kvatch Soldier". The art between Colovian Trooper and Kvatch Soldier was swapped in fall 2016. Colovia is the western region of Cyrodiil. This page was last modified on 16 February 2019, at 15:58.